We create a soft, satin, sensuous surface for the hand and eye. The surface of the wood is critical to the finish. We spend much of our time preparing the surface — sanding. Enough time so that sanding is the task for which we are least likely to express affection. But, "so smooth," "silky," "satin," "sensuous" we hear, and we are gratified and fulfilled. 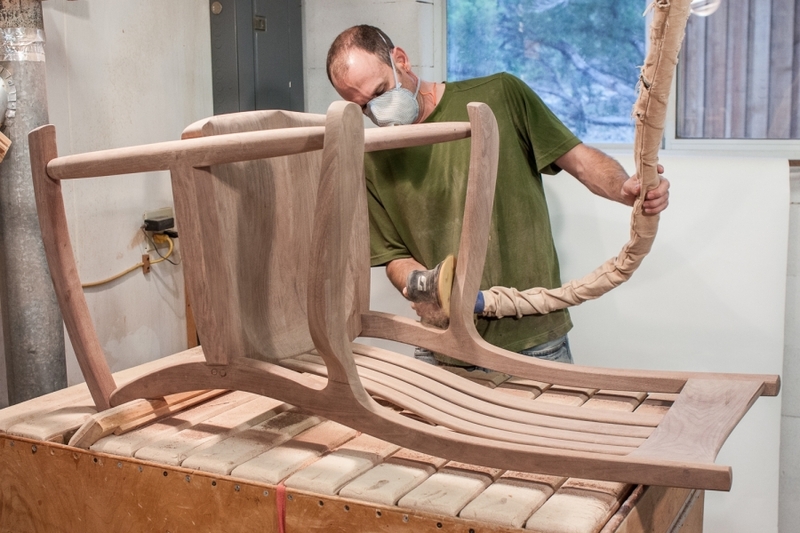 We use two methods to finish our furniture depending on its use and the preference of our patrons. Both are time-consuming, taking 5 to 7 work days to produce. They are the very best for their purpose that we have found--by the study of finishes in the industry and their performance over time; by our direct experience and our patrons' comments since 1992; and by testing samples in the finishing room. We use handrubbed oil on chairs, table bases, and other furniture and parts of furniture not serving as work surfaces. We varnish our table and cabinet tops so they can be subject to hard use.